From Joseph R. Smallwood,"The Story of Confederation," The Book of Newfoundland, Vol. III (St. John's, NL: Newfoundland Book Publishers, ©1967) 73. Crosbie attended Bishop Feild College in St. John's and an exclusive private school in Ontario. His family had forged a business empire starting in the hotel business and expanding into fish exporting, insurance, ship-owning and manufacturing. His father, Sir John Crosbie, had also served as an elected member of the government. 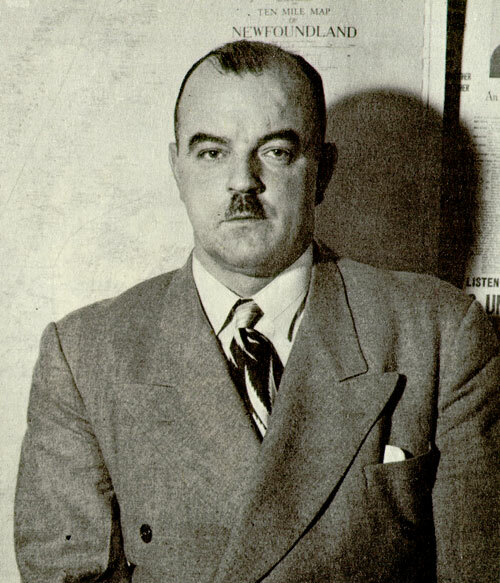 After his father's death in 1932 the young Crosbie took over the leadership of the company and ran the family's diverse business enterprises. One of the new kind of entrepreneurs, Crosbie took on new and extremely risky business challenges, some of which failed. Other members of the St. John's business elite concentrated on the export of fish and the retail of goods manufactured outside Newfoundland; Crosbie invested in whaling, the herring fishery and other nontraditional enterprises. Many people admired him for his boldness and his hard work. Despite the financial setbacks of the Depression, he and his family lived a life of wealth and privilege. Crosbie was a delegate to the National Convention and favoured the return of responsible government. After the Convention ended, a group of young men who favoured responsible government but feared that the Responsible Government League was losing the campaign, decided to form their own group. The Economic Union Party proposed a free trade agreement with the United States as an alternative to confederation. They recruited Crosbie as leader. He believed that if Newfoundland could export its resources to the United States the economy would be strong enough for responsible government to succeed. After confederation won the referendum, Crosbie served on the delegation from Newfoundland that negotiated terms of union. He did not sign these terms because he felt that the financial clauses would not allow Newfoundland's provincial government to balance its books. After confederation, Crosbie left political life and concentrated his efforts on his business.